You are at:Home»Daily Look»What’s next for GBP/USD after the recent rally? What’s next for GBP/USD after the recent rally? The GBP/USD enjoyed optimism on Brexit and also US Dollar weakness following the weak US inflation report. After topping 1.3100, what’s next? The Technical Confluences Indicator shows that cable faces significant resistance at 1.3188 where we see the convergence of the Pivot Point one-month Resistance 1, the Pivot Point one-day Resistance 2, and the Simple Moving Average 100-one-day. Further up, a noteworthy target is 1.3283 which is the Pivot Point one-week Resistance 3. Significant support awaits at 1.3050 where we see last month’s high, the Bolinger Band four-hour Middle, and the Pivot Point one-day Support 1. 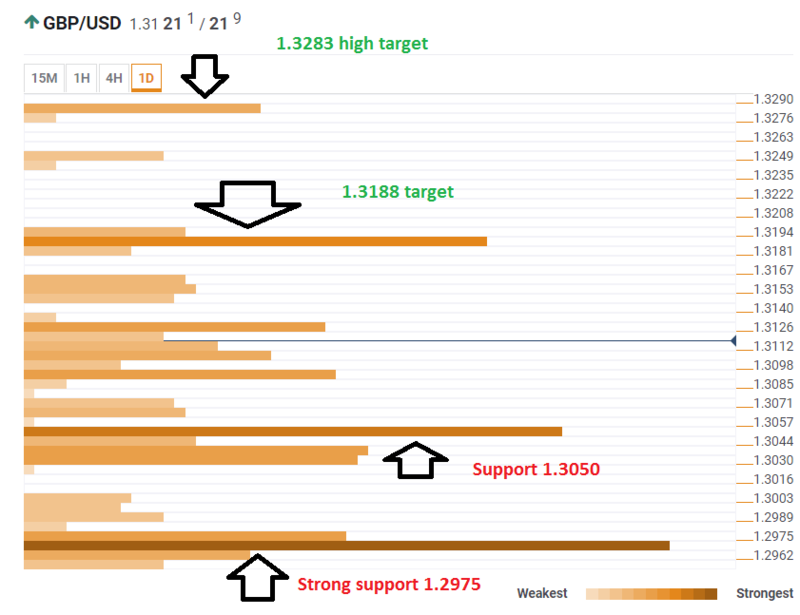 The strongest line of support is only at 1.2975 which is the dense cluster of including the SMA 200-1h, the SMA 50-4h, the SMA 10-one-day, the Fibonacci 161.8% one-day, and the Fibonacci 61.8% one-month.